In fiction and film, horror can be cautionary (Don’t go in the basement!) and even oddly comforting (Bad as things are, they’re even worse on Elm Street). But in times like these, when real world terrors outstrip our night terrors, how can a novelist possibly compete? 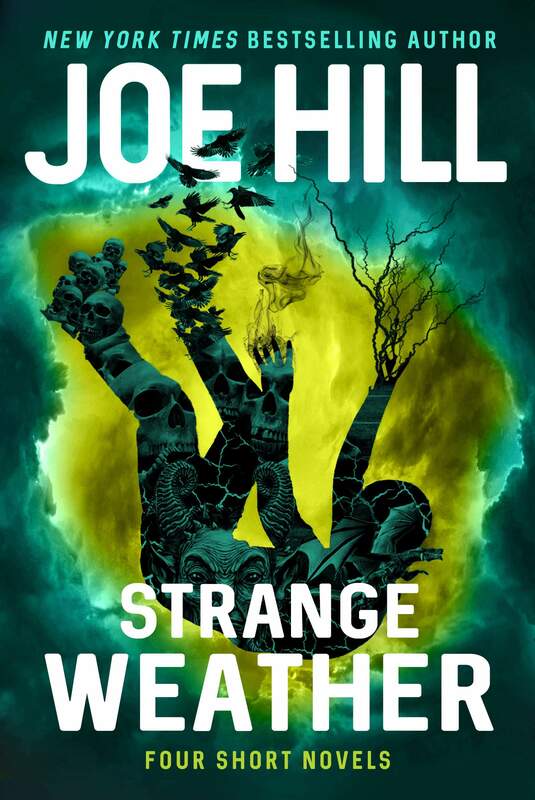 Joe Hill, the author of several terrifying best-sellers, rises to this challenge in Strange Weather, a striking if sometimes uneven collection of four short novels. But then an elderly neighbor, Mrs. Beukes, shows up at Michael’s door and warns him about someone she calls the Polaroid Man: “Don’t let him take a picture of you. Don’t let him start taking things away.” Michael dismisses her ravings as the early stages of dementia, but a run-in with the Polaroid Man at a convenience store convinces him that something far creepier is going on. Hill’s artful blend of 1980s nostalgia and supernatural unease is enhanced by his touching depiction of Michael’s encounters with Mrs. Beukes and her husband, an aging body builder distraught over his wife’s abrupt, inexplicable decline. “Loaded,” the most disturbing story here, recounts a decade-long history of gun violence, racism and domestic abuse in a Florida town. Hill deftly cuts back and forth between seemingly unrelated characters – a philandering lowlife and his teenage lover; an African-American journalist and her young daughter; a former military cop now employed at a fetid shopping mall; a dark-skinned young woman in a head scarf – building to a gut-clenching resolution as horrific and familiar as this morning’s news. After all this darkness, the whimsical “Aloft” provides a welcome break in the clouds. Aubrey Griffin is crammed into a single-engine Cessna with other first-time skydivers preparing to honor a friend who recently died. The appearance of a vast, UFO-shaped cloud and the subsequent failure of the plane’s engines cause everyone to make an emergency jump. The next thing he knows, Aubrey has fallen only 39 feet, not 12,000, and landed on the mysterious cloud. “He patted the mist ahead of him, stroked it like a cat. It firmed up into a lumpy, pliant mass at the first touch.” A dreamlike, affecting tale unfolds, as Aubrey’s memories and desires begin to come to life in ephemeral form. Anyone who’s gazed out a plane window at cloud mountains, or dozed in a field on a summer afternoon and imagined castles (and perhaps aliens) in the sky, will be enchanted. The ensuing downpour of crystalline needles kills Honeysuckle’s girlfriend and thousands of others, and destroys the area’s infrastructure. An increasingly apocalyptic scenario unfolds, as the spikes fall across the world. Hill’s scenes of glass rain are surreally beautiful and frightening; those of looters, mounds of corpses and emergency responders evoke other post-apocalypse books and movies and, sadly, recent events. Like our own national reports, Strange Weather leaves readers with a scant chance of hope on the horizon.